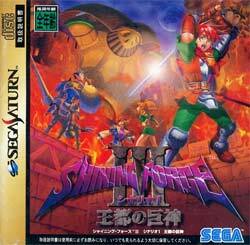 Shining Force III was one of the crowning jewels for the Sega Saturn and is one of the best strategy RPGs ever from the folks at Sega. However, there was a Scenario 2 and 3 in addition to a Premium Disc that never made it outside of Japan. KnightOfDragon has released his patch for Shining Force III Premium Disk to make it more accessible to the English-speaking world. The Patch is close to being complete but has some bugs and spelling/grammar errors that need fixed. Yes the Scenario 2 translation is coming along nicely too. I hope enough people can help out so this doenst die out before it gets completed. Supposedly, the patch simple to apply and it works great. I’ll have to get around to trying it soon. If all three scenarios are available in english someday it would just be amazing. Scenario 2 is getting close, but we’ll just have to be patient. Actually, I copied that line from the announcement I read. Picky, Picky. You must be F$%*ing kidding, this is the one Shining force III I dont have! AHHHHHH! Translate 2. I really want that now, I love shining force. my name has a 0 in 0f, and the server is still new, so till i find time to actually make a page, it will have to do. to knight0fdragon: youre a godsend for your hard work on these patches! however is there any way you could point us to the right direction for the resources to patch and translate other games? I would greatly appreciate it.